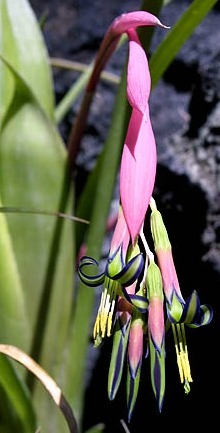 Billbergia nutans ( also known as Friendship Plant and Queen’s Tears) can be found growing on tree branches in the South American rainforests. It is a popular bromeliad that is easy to grow and share with friends and family. Mature plants grow up to 16 in/40 cm tall, with a spread of 30 in/75 cm wide. Queen’s Tears thick, strap-like leaves grow upright forming an urn that must be filled with water at all times. As the plant grows, the leaves arch outward. Plants bloom (usually in the spring) when they are 2 – 3 years old, bearing pendant red or pink bracts with green, purple, or yellow flowers inside. While too much light can make the leaves take on a reddish cast, increased light levels (available outdoors in the summer) encourage mature plants to bloom the following spring. This bromeliad tolerates dry indoor air better than other bromeliad species; however Queen’s Tears still benefits from a location that receives increased humidity. In the summer, friendship plants require a location that receives partial shade. From fall through early spring make sure these bromeliads are in a bright location. In the summer, warm outdoor temperatures should be 65 - 80° F / 18 - 27° C. During fall through early spring, room ideal temperatures are 60 - 75° F / 16 - 24° C. During winter, this bromeliad can tolerate briefly tolerate temperatures as low as 40° F / 4° C.
In spring and summer, feed leaves and roots every two weeks with house plant fertilizer diluted to ½ the normal strength. Feed monthly in fall and winter. In the spring and summer months, spray the leaves and water the reservoir and roots as needed to keep the cups filled and the roots lightly moist. In fall and winter, keep slightly dry to prevent root rot. Use an orchid potting soil or bromeliad mix. When the parent plant fails after flowering, use a sharp knife to cut it off at the soil line. Repot offsets when they are approximately 6 in / 15 cm tall. Repot annually in the spring until the bromeliad plant fills a 5 in / 12.5cm pot. Wait until Billbergia nutans flowers before propagating offsets. Individual plants usually live for three years. Friendship plants are typically sold by the species or common name. Be sure to purchase plants that have not produced flowers. Queen’s Tears make a beautiful display when grown at in hanging planters at eye level. The arching leaves and pendant flowers make a stunning impression when viewed up close. Be aware that the flowers weep drops of nectar when moved or touched.